Join the Auction! In-person or Virtually! Tickets to the 2019 Bonny Slope Auction are on sale now. Don’t miss this opportunity to support the enrichment programs and community events that make Bonny Slope such a special place for our students. AUCTION NIGHT EVENT TICKETS: Admission tickets on sale NOW until Thursday, April 11th. Enjoy dinner, drinks, contests, raffles, and a silent auction featuring great packages and student art. 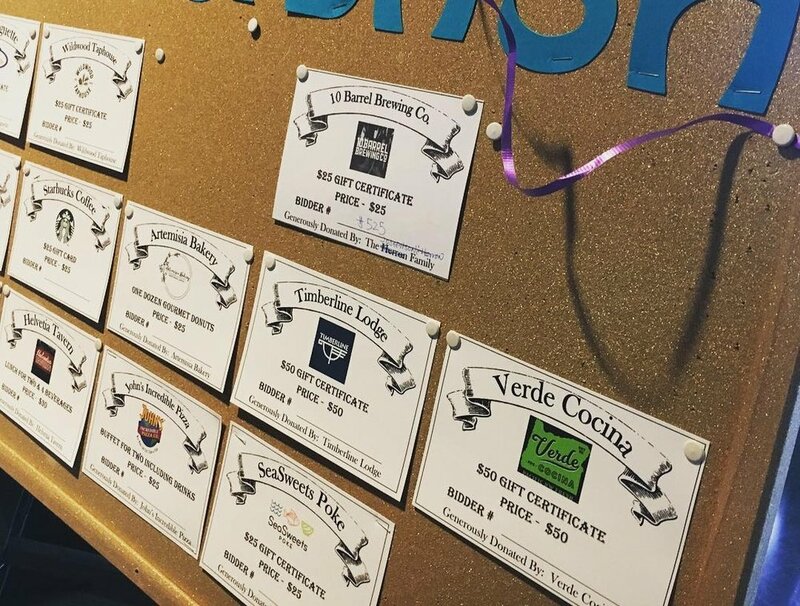 Secure your spot in one, two, or all of our popular adult/family parties hosted by our amazing BSE families. Join the fun and make memories for years to come. PRINCIPAL FOR THE DAY RAFFLE: A limited number of these must-have tickets are sold for $50 each and a winner will be drawn the night of the event (need not be present to win). 50-50 RAFFLE: Try your luck in our fifty-fifty raffle. The winning ticket holder will win 50% of the total money taken in by this raffle. Cost is $25 per ticket (need not be present to win). TEACHER EXPERIENCES: Grab a stop for your student in one of the hugely popular grade-level parties hosted by our wonderful teachers! These are a great opportunity for students to spend time with classmates and teachers in a fun atmosphere outside of school hours. No need to attend the auction to be mom and/or dad of the year! HOST A TEACHER: Pick up an admission or two for our awesome staff members! WINE WALL: Help to build our Wall of Wine and join us for a tasting at Erin’s Wine Cellar this Friday, March 8th from 6pm-8pm. We are looking forward to a night of fun, laughs, and memories! Join us! Come join us for a fun night out and help BSCO stock the auction's Wall of Wine. Erin's Wine Cellar is hosting a wine tasting event on Friday, March 8. There's a $10 tasting fee BUT you can use that towards any purchase of wine for our Wall of Wine. They will also be giving you a 15% discount on your purchase. Call your friends to meet up for a night out or come down to make some new friends. We have space reserved in the back room. If you can't make it that night, The Wine Cellar will continue to collect wine and offer the discount for two weeks after the event. If you would like to donate wine purchased elsewhere, please email Lisakteuber@gmail.com to arrange a drop off or pick up. Introducing the 2019 Bonny Slope Auction on April 14th! Tickets on sale NOW! We are excited to formally invite you to this year’s Bonny Slope auction. This event raises money to support to all of our BSCO programs which were recently highlighted at our winter community meeting. These programs connect with your student in a variety of ways such as technology updates for the classroom and ongoing teacher support. 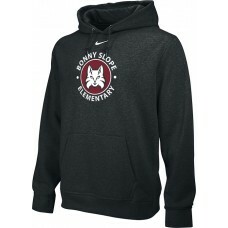 This is part of what makes Bonny Slope Elementary such a great school! Another part is our community. That is you and all of your support. So come out and join in on the fun of the auction. Book a sitter, purchase tickets to the auction, check out the raffles and teacher experience packages also available for purchase, and get ready to experience TopGolf gameplay fun. We are very excited for our new night and our new venue which will be the perfect backdrop to meet some new BSE friends, while supporting BSCO programs like Art Literacy, Coder in Residence, Science Night, Bobcat Trail Club, Geography Club, Parent Education Nights, Back to School Picnic, Carnival, Monster Mash, and so much more. Visit https://bonnyslopebsco.ejoinme.org/Tickets to grab your tickets today! Swing into Spring with the Bonny Slope Auction at Top Golf on April 14th! With the excitement of the snow this week it’s easy to look towards warmer weather. Mark your calendars for Sunday, April 14th as you are invited to join us at the Bonny Slope Spring Auction! Our auction and game play will run from 5 p.m. to 8 p.m. at Top Golf in Hillsboro. Tickets on sale February 22nd! This year we are very excited to host our annual auction on a new day and at a new location. The primary focus of the auction is to raise funds to support our BSCO programs, our BSE classrooms and our students. With that in mind we want to ensure that funds raised by YOU go towards the programs for YOUR students. As in the past, the evening will allow for the community to gather and to connect as we help to support our BSCO programs. So come and take a few swings in the golf bays, bid to win one of the many silent auction packages, and make some new friends over dinner and drinks. It is sure to be an evening you won’t fore-get! Q. Will the fundraiser still feature a silent auction? A. Yes. We will have a prize-filled silent auction like in previous years. The live auction will not be included as all items will be featured in the silent auction. We’re also trying out new technology for easy bidding while you play your round of golf. Q. Is this still a community-building event? A. Yes. The golf theme and backdrop is just the location for the auction. We will have plenty of space to mingle and connect with other members of our wonderful BSE community. No golfing experience necessary for the TopGolf game play activities. Q. Can I bring my kids? A. No. While Top Golf is a fun family activity, the auction event is an adults-only night. Come check out the location and book a tee-time for another family outing. Q. Is this a theme party? A. Yes and No! We know our community loves a theme so if you feel like it fairway attire is encouraged. Of course dressing up is always optional. The photo booth will have fun golf themed props for you no matter how you arrive. Q. What if I can’t attend? A. There are many ways for you to support BSCO programs outside of attending the auction. There will also be raffle tickets and teacher experiences available to purchase on the auction website in the coming weeks. You can also offer your support by volunteering or donating items. Q. 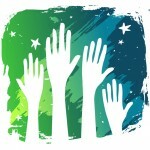 Want to sponsor the event, donate items for the silent auction, or help with the event planning? Pancake Breakfast Hits the Spot! Bonny Slope Elementary’s fifth grade class hosted its annual Pancake Breakfast this past Saturday. Over 600 people ate pancakes, sausages, and oranges, and washed it all down with juice and coffee. The fifth grade raised more than $5,500 to help with this year’s science school, to be held February 28th and March 1st. Our fifth graders, parent volunteers and Bonny Slope staff did a great job selling tickets, hosting, cooking, and serving. Thank you to everyone who helped! A special thank you to Jenny Johnson, Walmart, Starbucks, Trader Joe’s, and Bale’s Thriftway, and Costco for all of their generous support! Calling Sponsors for Bonny Slope’s 2019 Auction! Parents, do you own or work for a local business? Do you love Bonny Slope and all the great programs BSCO provides? Are you aware of the 20+ enrichment programs that are solely funded by the Bonny Slope Community Organization (BSCO) which impact your student on a daily basis? Do you want tickets to the fun that is the 2019 Bonny Slope Auction? If you answered yes, then we should talk! Note: Auction information can be found on the Fundraising Page. This week fifth graders were sent home with tickets to sell. You can purchase your tickets from your local, neighborhood fifth grader or online! Seating & serving will be done by our fifth graders as well. Remember, it goes to a great cause: fifth grade activities! Pancake Breakfast helps pay for a two-day science school field trip to study ecology and learn to build like the beavers do. Happy New Year!! Are you interested in helping out with this year's auction? We need you!! Please join our initial planning meeting January 9th at 6:30 pm at Erin's Wine Cellar (525 NW Saltzman). Opportunities to help: Procurement/Sponsorship, Event Planning & Marketing, Student Art, and Adult/Family/Teacher Sign Up Parties. Please don't hesitate to bring your friends or to share this. Interested in helping but can't make the meeting? Please reach out to us at auction@bonnyslopebsco.org. 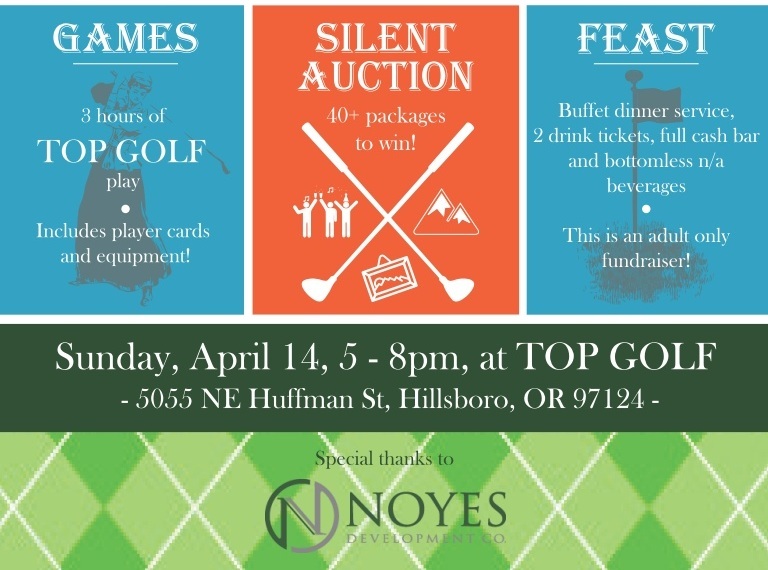 This year's auction is April 14th from 5 pm-8 pm at Top Golf in Hillsboro.